DOROTHY Nugent was a child when she decided that people didn’t live to 100. A cheeky, blue-eyed resident at Holy Spirit Carseldine, Dot found out how wrong her young self was when on February 23 this year she had her 100th birthday. “Years ago when I was a kid I used to think, nobody lives to one-hundred,” Dot said. 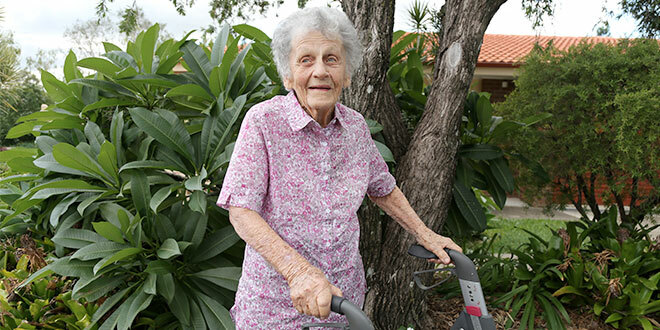 Born Dorothy Church in Brisbane in 1917 to a Catholic mother and an Anglican father, Dot is the eldest of five children, mother to four, grandmother to 16, and great-grandmother to 21. Not only has she lived through a great turnover of royalty, popes and prime ministers, she has written to most of them too. Dot has written to Queensland Elizabeth II, the governor-general of Australia, an array of politicians and, to her daughter Patricia Nutley’s surprise, even the Pope. “She rang up another day saying ‘I’ve written another letter’,” Patricia said. “She said you wouldn’t guess who to. While she may not have received a response, Pope Francis has given Dot an apostolic blessing for her 100th, a present organised by her neighbours at Holy Spirit, Carseldine. From her writing skills and her lifestyle, it would be hard to guess that Dot is 100. She has never been prescribed medication except a couple of Panadol for an arthritic knee but found it didn’t work and stopped taking them. Amazingly, Dot only quit driving five years ago at 95 years old and started using a walker in the past two years. She talks about her extraordinary life as though events just happened yesterday. When it was time for Dot to start school, she was enrolled in the local state school in Norman Park but only stayed in the classroom for six months. Dot’s daughter Mary McAndrews still laughs when she recalls the reason why she was pulled out of school. “Mum went to a state school for six weeks and her mother was frightened that she was going to become a communist or a Protestant – at five years old,” Mary said. So, instead of being educated by the state, Dot was sent down the river to the Good Samaritan Sisters who had opened up Lourdes Hill College in Hawthorne. “We had fun at Lourdes Hill,” she said. Having inherited her father’s cheeky “larrikin” personality, Dot’s school life was marked by several comic moments with her best friend Julie. “You had to go down past the nuns with gloves on and all that sort of thing, and we’d always forget our gloves,” Dot said. “So Julie would go past with her gloves and she’d go past the tennis court, throw them over for me to get so I could go past the nuns with gloves on. Sometimes Dot and her friends would just shove one hand into their pockets but the headmaster “woke up to that one”. Dot returned to Lourdes Hill to celebrate a Mass in the school’s chapel for her 100th birthday. Catholic faith is an important part of Dot’s life. While Dot learnt the Catholic faith from the Good Samaritan nuns, she caught the faith from her mother and father, who eventually converted to Catholicism. “He took instructions in the Catholic faith without anyone knowing as a surprise for Mum,” she said. Dot became acquainted with the universal Church when her brother, Percy Church, was ordained a priest for the Missionaries of the Sacred Heart. Having a missionary priest for a brother meant the Church family got used to welcoming strangers into their house, as Fr Percy would hand out the family’s address to missionaries flying into Brisbane. “And I remember one day Mum met me at the door – I was out – and she said, ‘Look, there’s some people here, I’ve given them their lunch – I don’t know who they are’,” Dot said. When Dot’s father died, the family learnt that he would make trips to the grocery store or the butchers and buy produce for strangers. Dot married Eugene Patrick “Nugget” Nugent in a flurry of back-to-back weddings at St Stephen’s Cathedral on April 6, 1942 in the middle of the Second World War. Having seen her parents welcome strangers into their house for a hot meal, Dot served up plates for people who turned up at her doorstep, including a couple of Mormon missionaries. “I felt so sorry for them because they were mostly from America and they were out here at Christmas time and they have nobody,” she said. Her concern for the lonely even grew into a ministry at her Bray Park parish. More than 40 years ago, the first priest at Bray Park, Spiritan Father Tom Crean, asked Dot to start an outreach in the community. “He said, ‘Look, there is a lot of very lonely people in this area’,” she said. Dot rounded up a number of parishioners to gather people “who didn’t know who their next-door neighbour was” and started Ozanam Club for the lonely. The group offered morning tea, concerts, dinners and movie nights, and opened it up to anyone isolated in the community, whether Catholic or atheist. “Some people were so lonely they didn’t know their next-door neighbour,” Dot said. The club still runs today, but its meetings are not allowed to start until Dot takes her seat. While she has no secrets to living to 100, she said having a family who loved and cared for her was a great blessing. “I was very lucky that I had a good family,” Dot said. “One of them comes every day.